During the 19th century, most butchers wore distinctive blue and white aprons with a straw boater and matching blue ribbon. 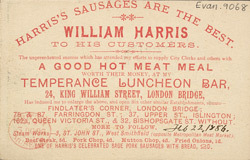 Each butcher specialised in a particular dish (Harris clearly specialised in sausages) and some even operated as snack outlets, with food served and eaten on the premises. Thus, Harris' butcher shop is advertised here as a Temperance Luncheon Bar. The Temperance Movement had been established earlier in the century, aiming to encourage the working classes in particular to renounce alcohol and spend their money on essentials only, thus allowing them to save for the future.